Yokogawa Electric Corporation (TOKYO: 6841) announces that it will release the Sushi Sensor, an OpreX™ brand wireless solution, in markets other than Japan, starting with Europe (shipping in March 2019). Already available in Japan, the Sushi Sensor is a compact wireless device with integrated sensing and communication functions that is intended for use in the monitoring of plant equipment vibration and surface temperature. Optimized for industrial IoT (IIoT) applications, the Sushi Sensor enables the online monitoring of equipment operating conditions, which helps to improve equipment maintenance and prevent failures by detecting signs of abnormalities at an early stage. As manufacturers strive to improve productivity and the efficiency of their plant maintenance operations, they have a growing need for solutions that facilitate the collection of equipment data. This is driving demand for wireless sensors that are easier and cheaper to install than conventional wired devices. 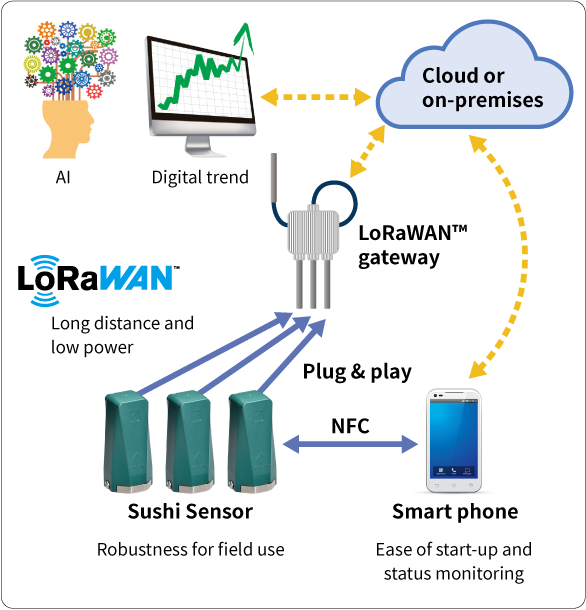 To meet this need, Yokogawa has developed the Sushi Sensor, a compact wireless device that measures vibration and temperature and uses LoRaWAN™, a low-power wide-area (LPWA) wireless data communication protocol that is attracting considerable interest among developers for use in IIoT applications*1. Yokogawa released the Sushi Sensor in the Japan market in March 2018, and has already established a solid track record with this device. Yokogawa also offers field wireless systems that comply with the proven and highly reliable ISA100 Wireless™*2 standard and help to ensure stable and safe plant operations. The European release of the Sushi Sensor is set for 2019, with other regions following after that, giving our customers in these markets a greater range of optimum solutions to choose from. The compact wireless sensor complies with the LoRaWAN communication standard for long-distance communications, and thus needs no repeaters. It is also battery-powered, eliminating the need for an external power supply. Being compact and light-weight, this sensor can be mounted easily on all kinds of plant equipment. In addition, the sensor supports near-field radio communication (NFC)*3, which allows sensor setting and sensor condition monitoring from a smartphone via a dedicated app. Although vibration sensors and temperature sensors for IoT applications are commercially available, most of them were designed for indoor use. Yokogawa's compact wireless Sushi Sensor is environmentally robust and is well suited for installation in harsh plant locations. Data collected by the Sushi Sensor can be monitored either from an on-premise server or a cloud server via a LoRaWAN gateway. From the on-premise server or any device in a remote location that can access the cloud server, operators and maintenance staff can monitor the vibration and surface temperature of equipment throughout a plant. For the monitoring of equipment operating conditions, the compact wireless sensor with integrated sensing and communication functions collects vibration and surface temperature data and transmits this data to an on-premise or cloud server via a LoRaWAN gateway. Oil and gas, petrochemicals, chemicals, electric power, pulp and paper, pharmaceuticals, food, iron and steel, water supply and wastewater treatment, metal, etc. *1 LPWA is a wireless communications technology that is optimized for long-distance communications and low-power consumption. LoRaWAN, an LPWA protocol that is based on an open standard, is promoted by the LoRa Alliance of more than 500 IoT companies and users worldwide. Yokogawa has developed a compact wireless sensor with integrated sensing and communication functions. The vibration and surface temperature data it collects are sent to the cloud and shared. With the help of AI analysis and machine learning processing, this enables degradation diagnosis and lifetime prediction of facilities, creating new value for the maintenance and energy management of plants. Yokogawa plans to develop applications for data analysis and actively promote this wireless solution for the IIoT as the Sushi Sensor. OpreX is the comprehensive brand for Yokogawa's industrial automation (IA) and control business. The OpreX name stands for excellence in the technologies and solutions that Yokogawa cultivates through the co-creation of value with its customers, and encompasses the entire range of Yokogawa's IA products, services, and solutions. This brand comprises the following five categories: OpreX Transformation, OpreX Control, OpreX Measurement, OpreX Execution, and OpreX Lifecycle. The Sushi Sensor works together with solutions in these categories to add value for our customers.